When it comes to acing the ASTB knowing the format of the exam is key. By knowing how the different sections are broken down and what’s involved in each you’ll have a far greater understanding of the types of questions you are going to encounter when taking the ASTB. The more familiar you are with the ASTB’s layout the fewer surprises will pop up. So, let’s get started. Continue reading below to learn more about each section of the ASTB and how they’re broken down. 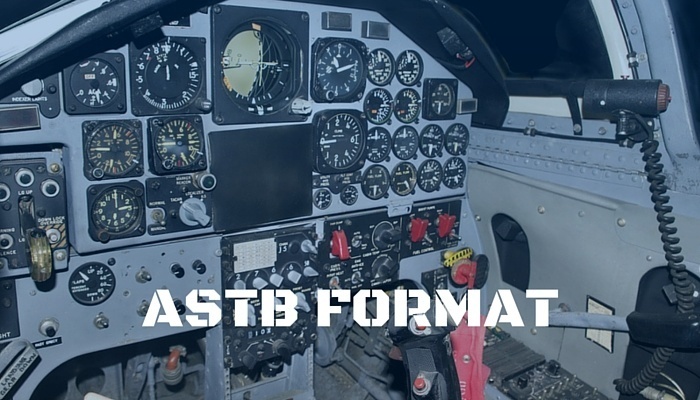 The ASTB is a computer based exam that is made up of 7 sections or subtests meant to measure the abilities of an individual in a common aviation environment. Its structure is comprised of all multiple choice questions. The 5 sections at the beginning of the ASTB are all computer adaptive. What this means is that the questions you are asked are based on how you answered the previous question. The ASTB computer program adapts to your skill level and asks you questions accordingly. The first four sections will be between 20 and 30 multiple choice questions. The fifth section or the NATFI which is a personality inventory will be comprised of 88 questions that are grouped in pairs. If a career in aviation is not your aspiration but, you want to become an officer you will still have to complete the first three sections of the ASTB known as the OAR or Officer Aptitude Rating. Typically completing just the OAR can take upwards of 2 hours while the complete ASTB typically takes a between 2 to 3 and a quarter hours. This is of course, with exception to the final section, the Biographical Inventory with Response Validation (BI-RV) which you are allowed to complete at home. Section 1: MST (Math Skills Test): The first section of the ASTB test, the MST, is very basic math. You will need to be able to do simple algebra as well as some arithmetic, and basic geometry. The exam will have some word problems and various equations where you will need to solve for different variables. There will also be some time and distance problems as well as the possibility of basic estimation and probabilities. You will need to be familiar with the use of roots, fractions, and exponents as well as be able to look at geometric shapes and figure out their area, angles, and perimeters. Section 2: RCT (Reading Comprehension Test): Various text passages will be presented with numerous multiple choice options for the examinee to pick. The examinee will need to choose the only true statement that can be derived from the passage itself. This may seem simplistic but, it can be tricky if you do not pay close attention to the specifics of the passage. Many of the options will seem to be ‘true’ but, there is only one option that is explicitly true given the text passage presented. Section 3: MCT (Mechanical Comprehension Test): This section of the ASTB exam could be likened to a high school course on an introduction to physics. The ASTB will use the basis of these principals and apply them to a various situations. The MCT will therefore be used to measure ones familiarity of how liquids and gases are able to affect the relationship between velocity, pressure, and volume. Questions on the MCT will also explore the mechanics of engines and simple machines (i.e. fulcrums and pulleys) as well as principles related to weight distribution, gears, and electricity. Section 4: ANIT (Aviation and Nautical Information Test): In the ANIT of the ASTB Test examinee’s will be tested on their understanding of nautical terminology and their associated procedures, the history of aviation, and other aviation concepts (i.e. aerodynamic principles, flight rules and their associated regulation, as well as basic aircraft components). This section of the ASTB is one of the ones that is easily improved upon with enough practice and study as it is largely a knowledge based test instead of strictly aptitude. The review of encyclopedias and general reference materials as well as aviation books for civilians and other manuals and handbooks related to the basics of seamanship, navigation, and piloting will be of use in the preparation for this section of the ASTB. Section 5: NATFI (Naval Aviation Trait Facet Inventory): This section is unique in that it asks that you answer a sequence of paired statements. All of the statements are in reference to how one may ordinarily act, think, or feel. Given this, it is unnecessary to prepare or study for this section of the ASTB. The intent of this portion of the ASTB is to forecast the likelihood of an individual being successful in a career in aviation. Section 6: PBM (Performance Based Measures Battery): This is the most practical aspect of the ASTB meaning it is the most ‘hands-on’. In this section your manual dexterity and processing speed will be tested. You will also be tested on your ability to function while your attention is divided between tasks (how well you are able to multi-task) – this will effectively measure your aptitude for dichotic listening and spatial orientation while using a mock-up of a stick and throttle. To start you will be supplied with a map that is North up. On it a symbol will denote the direction that you are standing in. On this map there will be four parking lots that are all adjacent to a building. Your first task will be to identify the cardinal direction of each parking lot. Before actually doing this problem for real you will be given the opportunity to practice it. A mock-up throttle, headset, and joystick will be supplied for this exercise. You will be able to hear groupings of letters and numbers through your headset. Your job is to press one of two buttons depending on whether or not an even or odd number in your left or right ear. After this portion of PBM you will then be directed to move an airplane on a screen using the mock-up throttle. The airplane on the screen will start out by only moving up and down but, will progress to moving around the screen in all directions. For more effective preparation for this section of the ASTB candidates will want to do as many mental rotation problems as they can. If you have access to a flight simulator that has a mock-up throttle-and-stick set make sure to take advantage of it for this stage of the ASTB. Section 7: BI-RV (Biographical Inventory with Response Validation): This is the take-home part of the ASTB. You can complete it on your own time on any computer that can hook up to the internet. This section of the ASTB asks you about your background and previous experiences in relation to your success or achievement in aviation. This again, is not a section you can really study for – all you are responsible for is answering honestly as all responses are neutral (none are either incorrect or correct when it comes to the BI-RV). Although you could complete this section anytime you like, it is recommended to complete the BI-RV section of the ASTB prior to writing the sit-down portion of the exam. It’s easy to see that a good score on the ASTB is within your grasp if you’re well prepared and are able to utilize fast thinking and make good decisions. Hopefully, you’ve gained a more thorough understanding and familiarity with the ASTB and its layout. To get even more comfortable with the format and what to expect please check out our free ASTB practice exam or check out an ASTB study guide. Need Help Passing the ASTB?